D365 Operations is available on-premise! …again. In the latest blog post of Sri Srinivasan the news about an on-premise solution for Dynamics 365 for Operations is making a comeback. Microsoft has been a bit back and forth on the topic, because when AX7 was released it had a road map that said an on-prem solution was in the works and it was disclosed that it was going to run on Azure Stack. 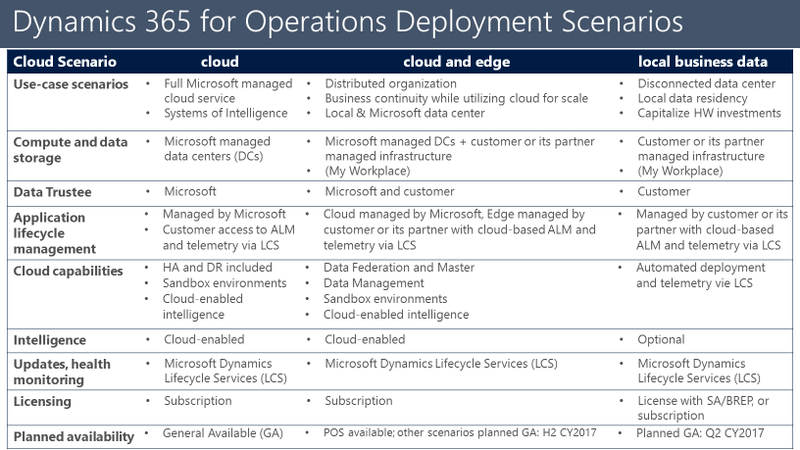 After a while this was redacted and when Dynamics 365 for Operations was launched, the only alternative was a SaaS solution and it would only be available in the cloud. That did not sit well with a lot of customers and partners and Microsoft went back to the drawing board. At Summit 2017 we were presented with the hybrid cloud solution where parts of the application workloads would be available as an partially offline solution to ensure better operational trustworthiness on sites, but it would sync up to the mothership in the cloud. It would have to be a hybrid solution as many of the services would only reside in the cloud. This is now referred to as “Cloud and Edge”. NOW we are at the stage where the business data will be able to stay on-prem indefinitely with the selection of the “local business data” deployment scenario. LCS will still handle the application and the benefit of Automated deployments are still there, but data will not leave the premise. Even an on-prem license through SA/BREP will be available! The distribution options for Dynamics 365 for Operations should now cater to any business needs through the model best suited for the customer. Thank you Microsoft for listening to your customers and partners. More information will be disclosed at D365 Tech17!